Winter is the time for comfort, for good food and warmth, for the touch of a friendly hand, and for a talk beside the fire; it is the time for home. When it comes to comfort food I always think of Chicken Fricassée. It reminds me of home, of hiking through a Colorado pine forest in winter. Quiet. 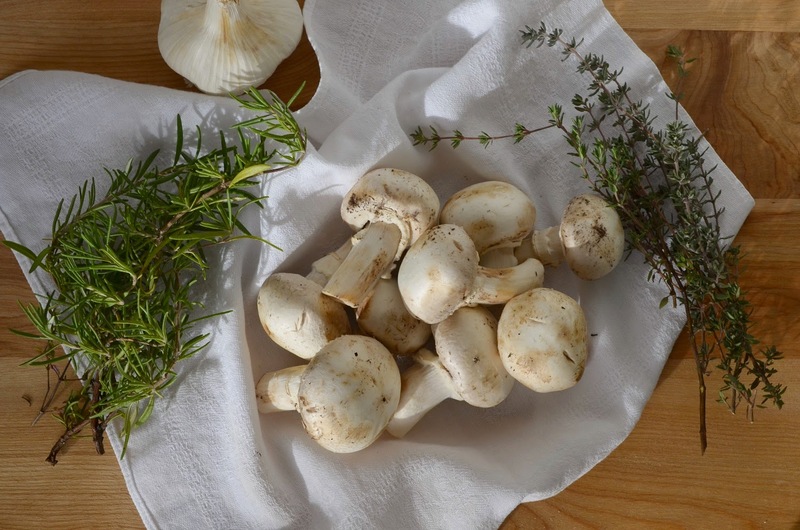 The woodsy smell of thyme, the earthy aroma of mushrooms rise from the pot like mist from the forest floor. Growing up in Colorado, these winter moments are what I miss most when I'm away. The perfect stillness of a snowy morning. The way the pine trees smell like toasted marshmallows and the way the air glistens with millions of microscopic snowflakes hanging suspended as if time itself has paused to take in the wonder of it all. These simple experiences are what say "home" to me. Which brings me back to Chicken Fricassée. It was one of the very first dishes I learned to cook from memory - and thank goodness, because I relied on it time and time again during my homesick years living abroad without a cookbook on the shelf. It's a dish that encompasses every aspect of home - like the warmth that radiates from the kitchen stove on a quiet winter night. I love to make a big batch and share with family and friends! This is a dish that, though it's one of my favourites, I often forget about it, in favour of trying something more modern and ultimately less satisfying. What is it about Chicken Fricassee that I like so much? I ask myself. Then I make it and remember. The slow-cooked chicken melts in your mouth. The mushrooms are meaty and full of flavour. The luscious sauce coats every morsel and is the perfect pool in which to dunk a big, crusty piece of bread. Yes, it's comfort food at its best! 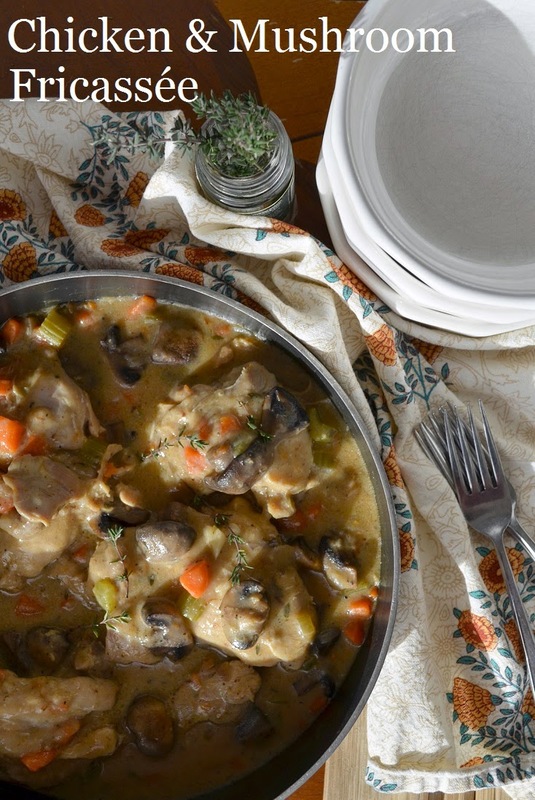 Fricassée is an old fashioned, thick French stew with a velvety white sauce. 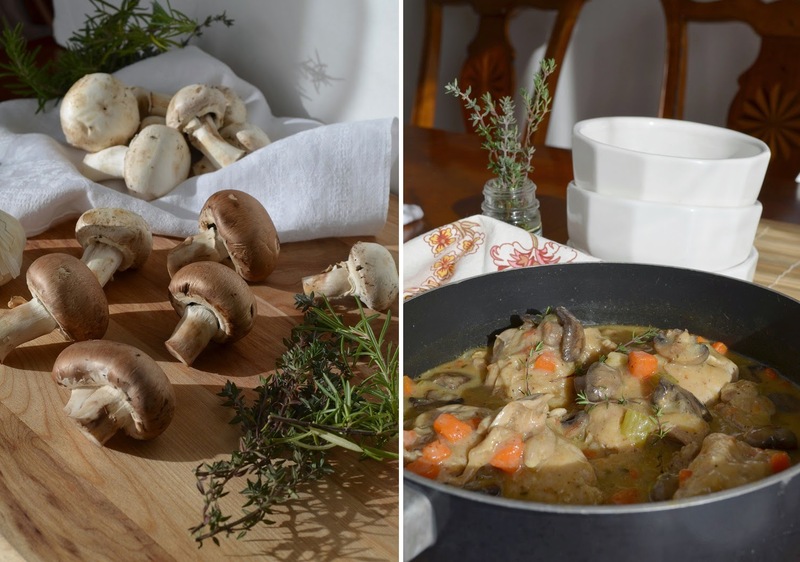 To keep its creamy white colour it's traditionally made with chicken, though it can be made with the other white meats, such as pork or veal. The meat is first cooked in butter until a lovely golden but not brown, then slowly braised on the stove. The sauce can be enriched with butter or cream just before serving, but I prefer to use an egg yolk. It gives the Fricassée a dense, smooth texture that can't be beat! And here's my secret to maintaining a light colour while still creating deep, rich flavours: cook the mushrooms separately over very high heat and fold them in at the last minute. It's another step, but so worth it! Melt the butter in a very large skillet with a lid or dutch oven. Rinse, dry and trim the chicken. Season with salt and white pepper. Cook the chicken in batches in the butter until just golden brown and still raw in the middle. Remove to a plate and cook the next batch in the same way. When all the chicken has been cooked til golden, add the onions and garlic to the butter in the pan and cook until soft but not brown, about 5 minutes. Sprinkle in the flour and cook, stirring for about a minute, then vigorously whisk in the chicken broth and bring to a simmer. Add the carrots, celery, thyme sprigs (the leaves will fall off while cooking and you can fish out the branches later), bay leaf, and salt and pepper. Nestle the chicken back into the pan and add the accumulated juices. Reduce the heat so that the stew barely simmers. Cover tightly and cook for 30 minutes. 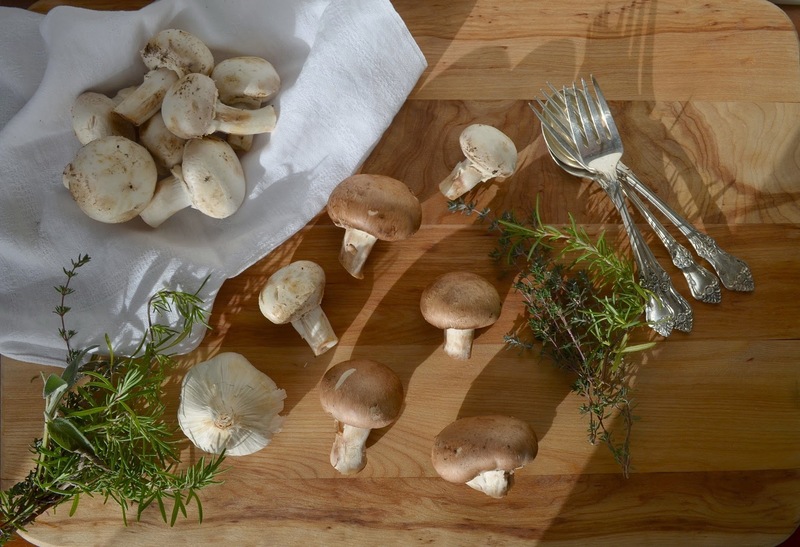 While the chicken cooks, prepare the mushrooms. Heat a skillet over high heat until screaming hot. Add the butter and oil. It should sizzle and melt immediately. Add the mushrooms all at once. Shake the pan to create an even layer, then leave them alone until they are a rich golden brown on one side. Stir the mushrooms and continue cooking until evenly brown and caramelized. Season with salt and pepper and set aside. After the chicken has cooked for 30 minutes remove the thyme sprigs and bay leaf. Mix the egg yolk and lemon juice in a small bowl. Slowly stir in a small about of the hot stew liquid then stir the egg yolk mixture back into the stew. Bring just to a simmer, stirring constantly. Remove from the heat and fold in the caramelized mushrooms. Adjust for seasoning and garnish with a few sprigs of fresh thyme.